At the beginning of the twentieth century Stravinsky created a work which continues to fascinate listeners today. The 28-year-old composer wrote Petrushka in 1910/11 for symphony orchestra for the famous Ballets russes, an ensemble of Russian dancers who were all the rage in Paris at the time. Petrushka tells the story of three puppets at a fair who mysteriously come to life. Endowed with human emotions, the clown Petrushka falls in love with the beautiful Ballerina. But his love is unrequited and leads to a tragic end. The music of Petrushka is rooted in the colourful world of the fairground. In addition to numerous Russian folksongs Stravinsky incorporates popular songs and tunes from Western Europe in his score. Not only are these melodies heard one after another; they sometimes occur simultaneously, creating the confusion and drama of a fair. Stravinsky’s work is thus both a dramatisation of the story of three puppets brought to life and an ingenious musical portrait of the world of the fairground. Stravinsky’s energetic music with its pulsing rhythms, intriguing sound effects and the dramatic story of the three puppets is an ideal basis for a wide-ranging education project. From the time we began to develop the project in spring 2007, it was clear that it would not culminate in a conventional performance of the work in a traditional concert hall setting. We strove to find a way of presenting the work which would enthuse people of diverse social and cultural backgrounds about Stravinsky’s music. We especially wanted to attract people who would not normally attend classical concerts. 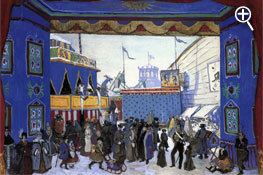 The solution lay in the work itself; in the spellbinding world of the fairground in which Stravinsky set his ballet. Thus on the 27th October 2007 the Bochumer Symphoniker played Petrushka, not in a concert hall, but in the middle of a colourful fair held amidst the industrial architecture of Bochum’s Jahrhunderthalle. Fairs have always been places where different cultures meet and engage with each other, where travelling showmen and traders presented the latest attractions and wares from near and far to a local population. The Petrushka plays, which the co-author of Stravinsky’s ballet, Alexandre Benois, saw as a child at Shrovetide fairs, were also the fruits of cultural exchange. They combined elements of Russian folk theatre and Italian improvised comedy. 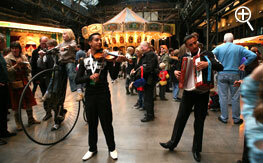 The Petrushka fair on 27th October 2007 was a meeting of diverse cultures. 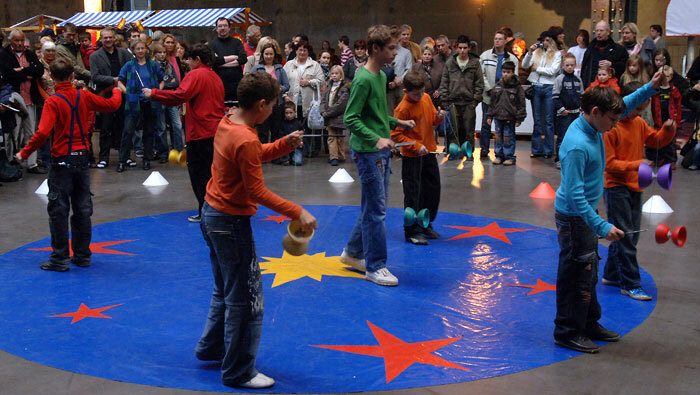 It was the opening event of the intercultural arts festival MELEZ, one of the core projects of the European Capital of Culture RUHR.2010. Lebanese delicacies were on offer alongside Vietnamese dishes; Turkish shadow theatre was flanked by Venetian masks; Russian folksongs and old-fashioned French popular songs were performed at the same time. With few exceptions the performers were amateurs: over 150 children and adults from the Ruhr Region. They played music, participated in theatre performances, served visitors with food and performed as jugglers, acrobats and magicians. We considered it to be important that the planned performance of Petrushka should not stand alone, but should become a part of the fair. To ease the audience into the full orchestral performance, two puppeteers were commissioned to perform a new version of the Petrushka story amidst the food stalls which included typical Russian specialities. Different music groups performed not only one after another but also simultaneously, creating a typical fairground cacophony of sounds and melodies similar to that which Stravinsky evoked so brilliantly in his music. 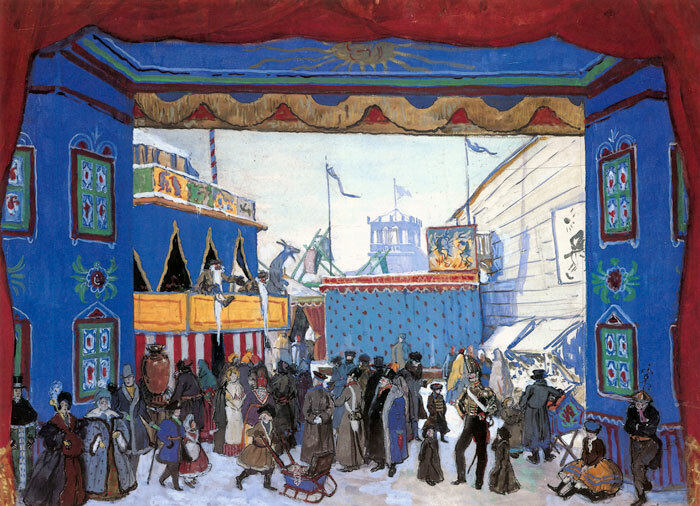 The fairground performers used some of the folksongs and popular tunes that would later be heard in the performance of Petrushka. There are, of course, fundamental differences between the Shrovetide fairs of 19th century St. Petersburg and our 21st century intercultural Petrushka fair. But by placing a performance of Petrushka in the middle of a fairground we were able to give the audience an experience and understanding of the cultural origins of Stravinsky’s fascinating work. For many listeners Stravinsky’s music was made more accessible both by the setting and by the inclusion of dance and film. 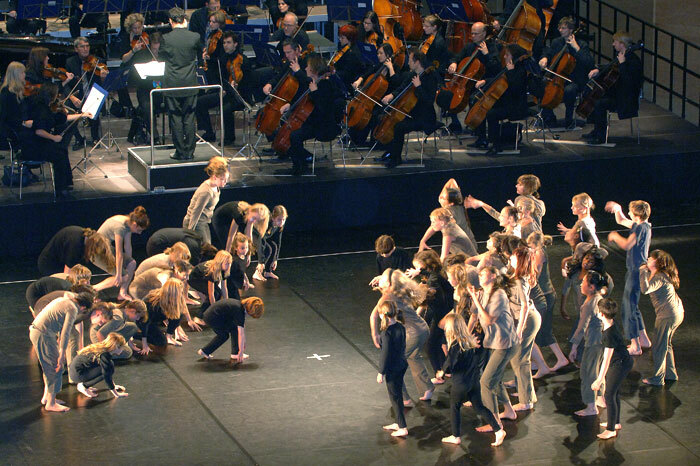 About 60 children and young people from the Ruhr Region gave a newly choreographed dance performance to some sections of Petrushka. This had been developed under the guidance of dancer and choreographer Mohan C. Thomas. Other sections of Petrushka were accompanied by a film by the English animation artist Victor Craven, which sketches the story of Petrushka and at the same time makes visible Stravinsky’s musical processes. The Petrushka fair was the climax of the wide-ranging education activities of the Ruhr Piano Festival and its partners. In autumn 2007 130 children and young people from the Ruhr Region had the opportunity to engage creatively with Stravinsky’s music, the Petrushka story, and the fairground theme under the guidance of experienced artists and teachers. We worked in different types of schools and involved the participants in a variety of art forms. In the dance workshops with Mohan C. Thomas, pupils from primary and secondary schools (Grund- und Hauptschulen) in Essen and Mülheim an der Ruhr developed a choreography to parts of the ballet. At the same time pupils from comprehensive and grammar schools (Realschulen und Gymnasien) in Bochum worked on Petrushka in art workshops led by painter and graffiti artist Daniel Man. They made three larger-than-life wooden figures which were put on display at the fair in the Jahrhunderthalle. 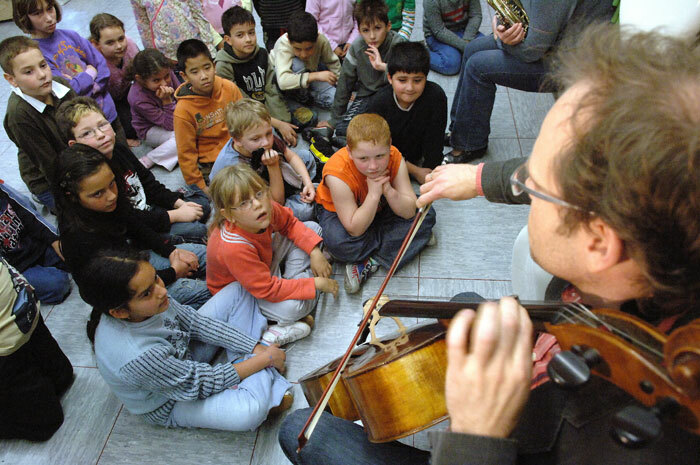 50 primary pupils from two primary schools in Bochum, together with members of the Bochumer Symphoniker and Richard McNicol, invented their own music for a puppet-show version of Petrushka in preparation for the big event, and later gave performances to other pupils in their schools. Germany’s Ruhr Region is an area with a large immigrant population. Today almost half of all children in the region have a non-German background. In our selection of participating schools for the Petrushka project we wanted to reflect this cultural diversity and at the same time involve pupils from various social backgrounds with varying levels of education. The 130 participants in the workshops represented over 20 different countries. The workshops helped pupils to strengthen and develop their creative abilities. Through their own active artistic input they were able better to access to access and understand Stravinsky’s music. We aimed to encourage not only the participants themselves but also their families to take an active role in the cultural life of the Ruhr Region. 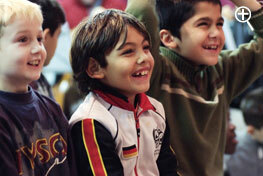 For this reason the children’s parents were invited to the performance in the Jahrhunderthalle. There they were not only active participants in the intercultural fair; many also experienced Stravinsky’s captivating music for the first time.